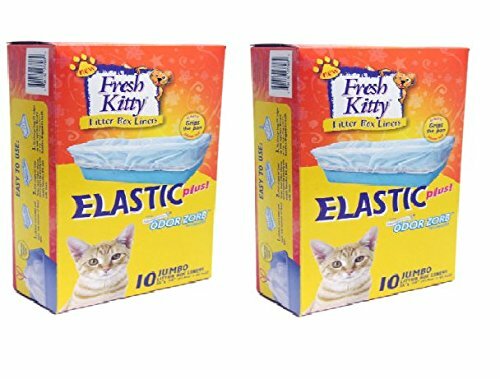 » Cat Litter Box Liners With Elastic – Why Are They So Popular? Why Use Cat Litter Box Liners? Cleaning the litter box is one of those chores that has to be done but let's face it, ​any way to make it easier ​is going to be welcome. Using a cat litter box liner solves the problem of the cat's waste being stuck to the bottom of the box. The whole liner, litter and all is tossed away or if the liner is still okay, it can be reused. Not everyone likes litter box liners because they can tear and move about and fall back into the box. The solution is to get a liner that has elastic around the edge. 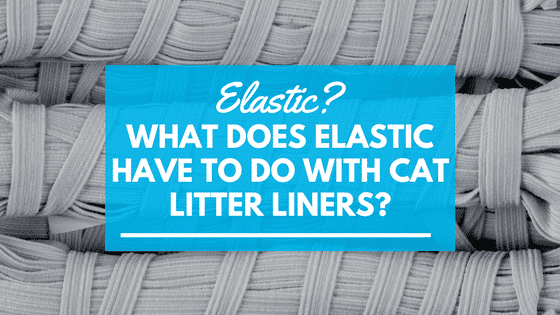 What Makes The Elastic Liners Popular? The elastic is around the edges, to keep the litter box liners in place. Litter box liners can sometimes to scrunch up when the cat starts digging. Even if the sides of the liners are over the edge of the box, ​once the litter is added, the liners can frustratingly fall back into the box. Elastic liners fit right over the edge of the box and with the added advantage of being secured by elastic, they are less likely to move about. The elastic eliminates the problem of the liner falling back into the box when the litter is poured in. You still need to be careful about pouring the litter in, don't dump the litter into the box, the liner may still come off. Pour the litter with some control and keep an eye on the liner. The video below shows how to use a litter box liner. It's an excellent video to get a basic understanding of how liners work in a litter tray. The liners used are not elastic liners and in the video, Karen does mention that the liners she was using were not top quality which is why she has two bags in the tray. Cat litter box liners make the job of cleaning the litter box easier. 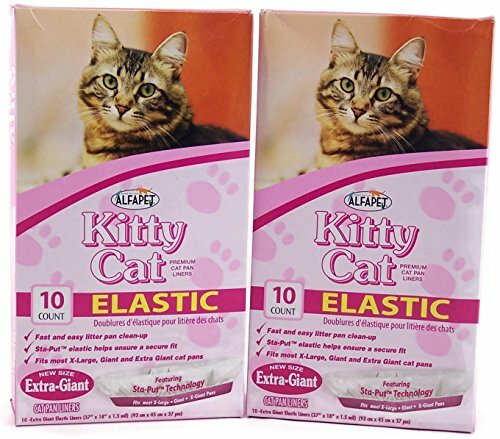 The quality of the liner is important and cat litter box liners with elastic will help to keep the liner in place both when the cat is using the box and when it is being cleaned. Cheaper is not always more economical if it means using two liners instead of one. ​The Whisker City liners have the edge when it comes to thickness. Litter box liners prolong the life of the litter box. Eventually odors ​get absorbed by plastic​. ​In reference to the litter box, odors can be difficult to remove as you have no doubt experienced with other plastic products. We have reviewed three of the best cat litter liners that are secured with elastic. The Fresh Kitty liners have both an elastic and a drawstring feature which is handy to use when disposing of the litter. This is in contrast to most liners which are usually just drawstring or just elastic so this is something to consider. The pack of 2 Extra Giant size comes with 10 liners in each box. They measure 36"x 18" and are 1.5 mil. They are heavy duty and will resist tearing. To use: Fit a liner over the edge of the litter box. Fill the box with your preferred amount of litter,approximately 3" is a handy reference guide. When you are ready to dispose of the litter, lift the edges of the liner, secure at the top and dispose of the bag and its contents in the regular garbage. No more digging around trying to find the edge of the liner, which may have fallen back into the box. The elastic makes it easy to find and then remove the liner and litter. There is no doubt that some cats will scratch the liners however these liners are heavy duty. The cost may at first seem an unnecessary expense, however you are paying for convenience and that can be priceless. This box is the large size and contains 40 liners so that is an important consideration. There will be no need to buy as often. The measurements are 31" x 17" with a thickness of 2 ml. I'm not sure why the measurements are a mixture of imperial and metric. 2 ml is thick for a liner and for those of you not familiar with ml as a measurement, 2 ml is approximately 1/16 inch. Note: Some products are 1 ml in thickness, so check packaging before purchasing. The thickness means that the liner will not tear easily plus it will be easier to scoop. Scooping with a lightweight liner would mean constant straightening of the liner (tugging back into place) to allow the scoop to actually scoop without gathering up a thin liner of liner with the scoop. The product shown is the large size, however there are other larger sizes available. This is a link to 20 X-Large liners. This is a link to 30 X- large Liners. Each box contains 10 liners. The measurements of the liners are 36" x 18". These liners have a little secret. In addition to the​ elastic edge as can be seen in the diagram they also have a drawstring which is super handy when it comes time to dispose of the liners. Lift the elastic liner from the box, pull the drawstring and dispose. In addition to making it easy to clean the box, the elastic is going to help the liners stay in place while kitty is turning in circles to trying to find the best box location of the day. For size​, we like the Alpha Pet cat elastic litter box liners. 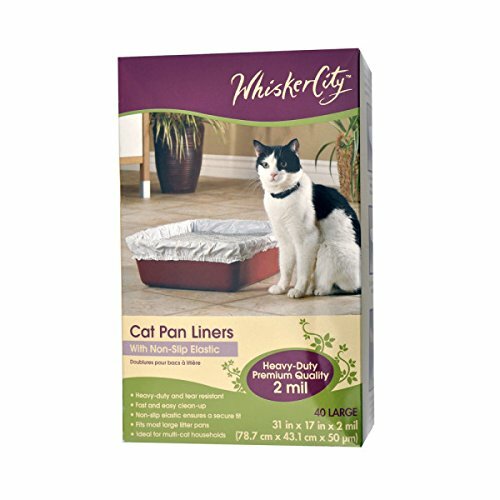 We love the thickness of the Whisker City liners. At mostly 2 ml or 1/16 inch (check packaging) they are going to withstand a fair amount of scooping and digging. Another plus for Whisker City is that different sizes are available. The Fresh Kitty liners ​ have the bonus of an elastic edge and a drawstring top.